Crystal Paradise Resort "Our Belize Vacation" - "Our Belize Vacation"
Crystal Paradise in Belize offers a unique and intimate way to experience the magic of Belize. Join us on your Belize vacation, and you will remember your Belize trip for a lifetime. 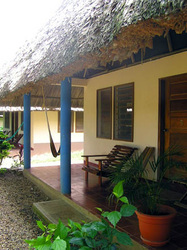 You can book your activities on a day to day basis or choose from our Belize vacation packages. 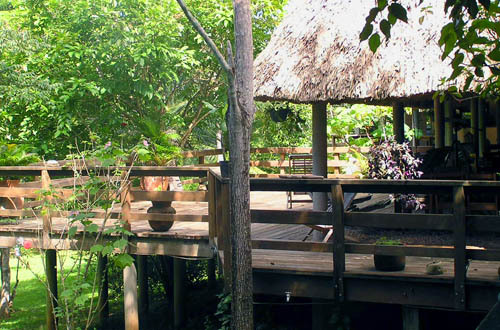 This Belize eco lodge is located in the lush jungle and alongside the beautiful Macal River, a secluded location but still close to San Ignacio, the major town of the Cayo District. Combine this exotic atmosphere with genuine Belizean family hospitality, and the result is a rare encounter between culture and adventure. 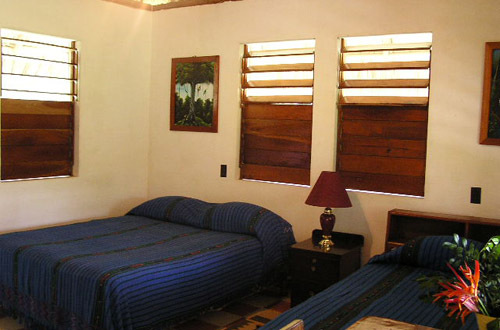 We provide our guests with the opportunity to explore the country's many wonders while staying in comfortable accommodations that reflects Belizean culture. 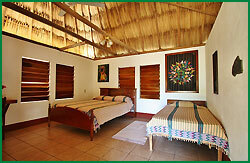 It is one of the few Belize resorts, and Belize eco friendly Jungle lodges owned and operated by a Belizean family. 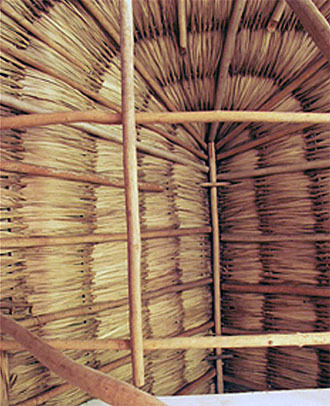 Crystal Paradise Resort in Belize was hand built by the Tut family, using the ancient art of palm–thatched roofs that compliment with the natural beauty of Belize. Our large family runs this Belize eco-lodge and Jungle resort as a team to offer you the finest Belize accommodations along with a wide variety of activities and tours, offering you a Belize vacation that regular hotels can't compare with. It has been a favorite in Belize travel for more than a decade. Belize accommodation rates can include two delicious meals dinner and breakfast in addition to your Belize lodging or you can purchase meals separately during your stay. Under the supervision of our mother, we serve up the best home cooked meals including a variety of local Belize dishes, home grown coffee, vegetables and seasonal fruits. 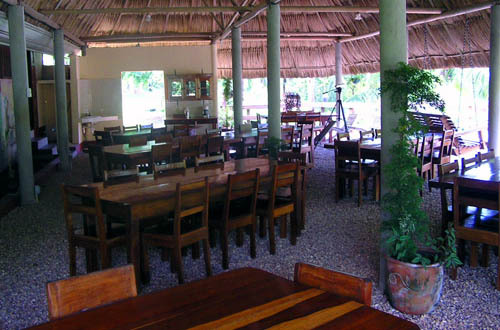 Our open air dining room and self–service bar overlook the surrounding jungle, so after a day of activities, come and join us out on the deck, enjoy the Belize botanical gardens or relax in a cozy hammock under a thatched roof palapa. Although the climate and Belize weather vary slightly by season, Crystal Paradise makes a wonderful Belize vacation destination all year long. 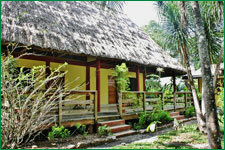 This Belize resort and Jungle eco-lodge is owned and operated by the Belizean Tut family. 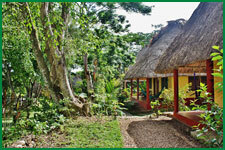 The Resort Grounds - Crystal Paradise is situated on 21 acres of land near the Macal River see Belize map. The Belize jungle is rich with a diversity of life. Over 265 species of Belize birds have been sighted on the Crystal Paradise property. In addition to a number of orchid species, there are over 150 species of plants and trees that are found on the property. Fruit trees such as mangoes, pineapples, avocados, bananas, and citrus, as well as many flowering plants and trees can be seen year round. The Trails - There are a number of jungle trails. Guests can easily spend an hour or so leisurely walking the trails either spotting birds and or learning about many of the Belize medicinal plants that we have labeled and have developed booklet with a description of the plant and its uses. 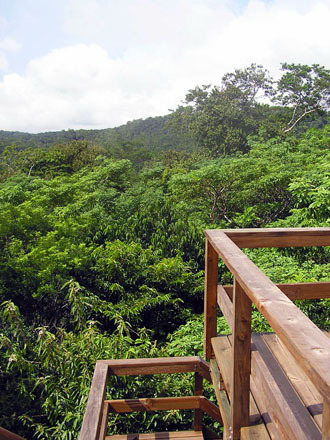 Bird Perch - This Belize Birds observation platform was built so that our guests can enjoy an above-the-canopy view and Belize jungle experience. The deck is a great place to watch birds or sit back and enjoy the Belizean sunsets and a quiet place to read a book and or simply enjoy nature. We pride ourselves in making you feel at home. 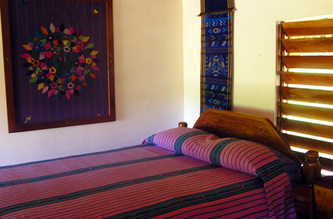 Belize hotels Belize lodges and Accommodations in western Belize We are happy to offer several Belize lodging options to suit different tastes and budgets. All of our cabanas are fully screened, equipped with ceiling fans, private baths with hot showers. 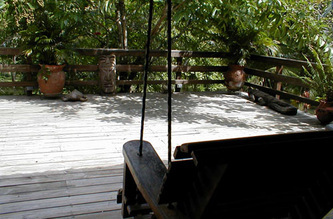 You can relax and listen to the sounds of the Belize jungle from your very own veranda with a hammock and desk chairs for your comfort. All our Belize accommodations include two daily meals. These Belize lodging cabanas offer a breath taking view of the Macal River valley and surrounding Belize Jungles. 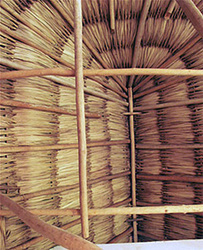 A gentle breeze and the thatched roof make the temperature inside these Belize Cabanas pleasant both day and night. Each cabana contains a queen–sized bed and a twin bed. Has 1 queen and a twin bed. Room #1 to 7.